This is the track of Sputnik, the first satellite launched from Baikonur Cosmodrome at latitude 46 degrees north. Launches from Cape Canaveral followed paths that were more flattened out because they were launched from 28 degrees north. 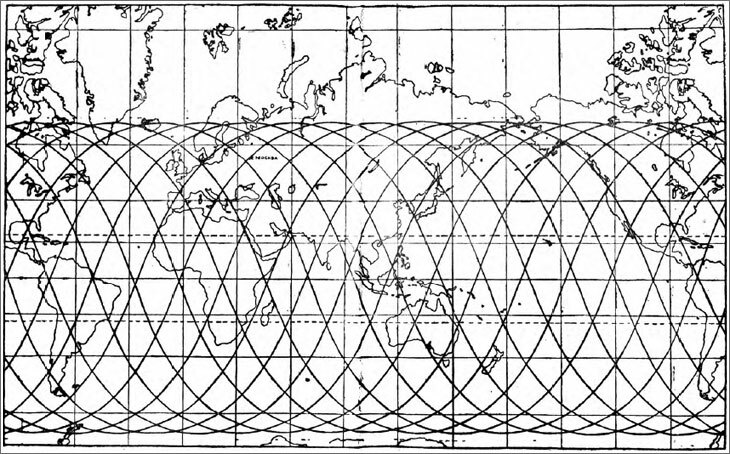 The orbital path shown above was to be found in thousands of publications at the dawn of the space age. Everyone carried the image in their heads, but today I had a hard time finding it on the web. My how times change. Every space geek in 1960 would have known everything in this post, but then Star Trek came along. Kirk and Spock, and especially Uhura, went at warp speed and walked around on the floor like it was a sound stage in Hollywood. No weightlessness there. Then Star Wars came along and all veracity went out the viewplate. There were a lot of very basic principles of physics that governed the space program, which Hollywood had to ignore. Let’s begin on the ground. The Earth rotates eastward at a certain number of miles per hour. (We are channeling 1960 here. None of the published reports on space used the metric system back then.) Any geek with a pencil could figure out rotational speed by dividing equatorial circumference (25,000 miles to any 1960’s space fan, forget the decimals.) by the length of the day. !042 miles per hour eastward at the equator. A spacecraft in low Earth orbit flies at 17,500 miles per hour. Actually that varies, but that was the figure in all the space enthusiasts books at the time. If you launched a rocket eastward, you started with about 1000 mph of free speed. If you launched westward, it would cost you 2000 mph of extra speed. You wouldn’t gain the natural advantage, and the rocket would be going 1000 mph the wrong way as it sat on the ground. There was actually another reasonable option, launch north or south. We’ll look at that choice at the bottom of the post. Actually you don’t get all of that speed advantage. The circumference of the Earth is less as you move northward, lowering the eastward speed. If a United World wanted to choose the most advantageous place for a spaceport, it would be at high altitude somewhere on the equator. That happened frequently in science fiction. Neither America nor Russia had a far southern point suitable for a space port. America’s best choices were Texas and Florida — the same two states Jules Verne pointed out in From the Earth to the Moon. Florida had the added advantage of having the Atlantic ocean to eastward, which provided a place to drop first stages and failed rockets, without landing on anybody’s house. Russia built in the desert at the same latitude as Portland, Oregon, but they always chose secrecy over other factors. Launching eastward is an exaggeration, of course. Straight east from either site won’t work; launches had to be aimed south of east to bring the center of the orbit into line with the center of the Earth’s gravity. You might think that a launch from Canaveral would return to Canaveral after one orbit, but that isn’t true. The Earth is rotating eastward, so a spacecraft launched from Canaveral will pass over a spot about a thousand miles west of Canaveral on its first return. And so forth. Which is why the cosmonauts were a thousand miles off target after one extra orbit in yesterday’s post. All this gives us that odd spiral at the top of the post. In fact, you could launch a spacecraft into orbit from any point on Earth as long as its orbital path circled around the Earth’s center of gravity. Further south is simply more efficient. You could even launch satellites due north, and we do, from Vandenberg Air Force Base on the west coast of California. Such satellites also spiral around the Earth, but they cover every part of the Earth eventually. Weather and spy satellites use this orbit. Southeastward launches from Canaveral and Baikonur don’t cross over the far north or the far south. What about a satellite exactly circling the equator? In low Earth orbit, it would circle the Earth about every 90 minutes. The moon, a quarter of a million miles further out, circles the Earth in 29 1/2 days. Clearly, even for math challenged enthusiasts, the further out the satellite, the slower it travels in orbit. At some distance from the center of the Earth, it would take a satellite one day to circle the Earth. Seen from Earth, it would appear to hang in one spot above the equator. Everybody should know that, because that is how communication satellites work. The first person to recognize the fact and calculate the distance was Arthur C. Clarke, known even to non-SF readers from 2001, a Space Odyssey. The connection between science and science fiction has always been close. 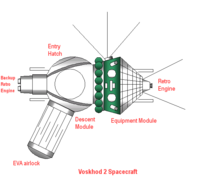 This entry was posted in A Writing Life and tagged Arthur C. Clarke, history, space travel, spaceflight, writing on March 25, 2019 by sydlogsdon. This is the rest of Tuesday’s post. If you haven’t read it yet, take the time to do so, or this won’t make much sense. Alexey Leonov had extreme difficulty reentering the airlock. His space suit had over inflated; the boots and gloves had slipped beyond his toes and fingertips, and his suit had increased in girth. He had to vent part of his rapidly depleting oxygen in order to bring his suit down in size, and even then he entered the airlock head first, instead of feet first as planned. Once inside the airlock, he had extreme difficulty contorting his body to close the outer door. All this time, his body was heating up dangerously; surrounded by vacuum, there was nothing to carry away the heat his body was generating. When communications were restored, ground control asked them where they had landed. Their orbital path was set; the moment of firing their retro rockets would determine where on that orbit they would land. They chose a target just past the Urals. Using the clumsy and difficult manual backup equipment, they achieved the correct attitude and fired the retro rockets in the conical rear portion of the craft called the orbital module. The orbital and landing modules were supposed to separate ten seconds after retrofire. They didn’t. The two cosmonauts knew immediately that something was terribly wrong. Instead of the steady press of force against their backs as they decelerated, they found themselves whipped about by confused forces that exceeded ten gravities. A communication cable between the two modules had failed to release, and now both modules were whipping about each other, tethered by the cable. Finally, about 60 miles up, the cable burned through and the cosmonauts were freed. The drogue chute deployed, and then the main. All was peaceful and in order – briefly. Then it became dark as they dropped below cloud cover, the final rocket fired to slow them to landing speed, and they touched down in six feet of snow. They were 1200 miles beyond their intended landing point. They blew the explosive bolts to release the hatch. It didn’t open. They had landed in the middle of a forest and the hatch was held shut by a tree. By yanking violently they dislodged it and it fell away, lost in the snow. They made their way out of the spacecraft and waded through snow to a small clearing. Those back at headquarters had not heard their landing signal, but a passing cargo plane had. It circled, and was soon joined by other planes and helicopters, but none of them could land in the rough taiga. Pilots threw a bottle of cognac; it broke. They threw warm clothing which got caught in the trees, but at least two pairs of wolfskin boots made it to the ground. The light was failing. The cosmonauts returned to their craft for shelter. Leonov was walking in calf deep sweat still trapped in his space suit from his space walk. Both cosmonauts stripped, removed the liners from their space suits and wrung them dry, then put the on again along with the wolf skin boots. They abandoned the useless space suits and crawled into the landing module for the night, well aware that the taiga was filled with bears and wolves, and that this was mating season, when they were most aggressive. The hatch was out of reach. The lights failed, but the circulation fan ran all night, adding to their misery. The temperature dropped to 22 below zero. A rescue party arrived on skis the next morning; they chopped trees to build a small log cabin and a big fire. The cosmonauts spent a second night, then skied out to where a second, larger party had chopped down enough trees for a helicopter to land. I guess they made ‘em tough in those days. I suspect they still do. This entry was posted in A Writing Life and tagged cosmonauts, forgotten heroes, history, space travel, spaceflight, writing on March 20, 2019 by sydlogsdon. I posted this in 2016, under the title Spacecraft Threatened by Bears. The title was snarky but accurate. Back then I had few followers, so it seems time to post the amazing story again. My admiration for the people of the early American space program is boundless, but the Russians were no slouches either. They were the first to perform many feats, including the first space walk, during the flight of Voskhod 2 on March 18-19, fifty-four years ago. I had the great good fortune of living through the early days of manned space flight. I was nine years old when the Russians orbited the first satellite, and the early manned flights came when I was in high school. I watched every American launch with fascination and envy, but the Russian launches were shrouded in secrecy. I knew only the bare minimum that all Americans knew. I’m not sure the president knew much more. During those early days, nothing was routine. Every mission was dangerous. They still are, of course, but not so much as then. American failures were there for all the world to see, while the Soviets kept their’s secret. After the breakup of the Soviet Union, information about the early Russian space program became generally available, but by then few people cared. I did, and I sought out the stories. Oceans are big targets and landing in water cushions the fall. That is why Americans always splashed down. The Soviets were unwilling to land their craft anywhere outside of the USSR for reasons of security. Their hard landings had an effect of the design of their spacecraft. The first six manned Soviet spaceflights were aboard Vostok craft, which came down on land — hard. Vostok astronauts wore space suits throughout their flights and landed by personal parachute separate from the capsule. Before the second generation Soyuz spacecraft came on line, the Soviets launched two additional manned missions on modified Vostoks called Voskhod. On Voskhod, an additional rocket was added to the spherical descent module to fire at the last minute. This softened the landing enough so the cosmonauts could remain within the descent module all the way to the ground. Since ejection seats were no longer used, the weight saving allowed Voskhod 1 to carry three astronauts. Voskhod 1 cosmonauts flew without space suits, as did early Soyuz missions. Voskhod 2 cosmonauts Belyayev and Leonov wore space suits because they were scheduled for the first space walk. American space walks first took place during the Gemini program (see post 87). That craft had two hatches but no airlock; both astronauts were in vacuum during the entire spacewalk. To exit his Voskhod in space, Leonov used an inflatable airlock (see drawing above), leaving Belyayev in the craft and unable to aid him. I had known this for several years but just in the last few days found out why. Russian electronics within Vostok and Voskhod were air cooled. American electronics were not. This meant that if a Voskhod were opened to space, the electronics would overheat. On Voskhod 2, Leonov crawled into the airlock, sealed the inner door and opened the outer one. Belyayev remained in the pressurized descent module. For ten minutes, Leonov remained within the airlock but exposed to the vacuum of space, then he slipped free and floated on a tether for another ten minutes. He was called back in to terminate his space walk, and his difficulties began. This post concludes on Thursday. 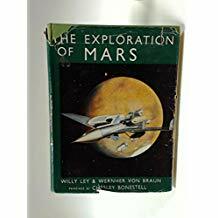 This entry was posted in A Writing Life and tagged cosmonauts, forgotten heroes, history, space travel, spaceflight, writing on March 18, 2019 by sydlogsdon. Apollo 9 was the first mission to fly full and complete: Saturn V booster, CSM, LM, and lunar rated spacesuits. They weren’t going to the moon, but they were checking out all the equipment that would take astronauts there. Jim McDivitt was Commander, David Scott was the Command Module Pilot, and Rusty Schweickart was Lunar Module Pilot. Those designations are a bit misleading. Flying any part of a mission frequently took all hands. It took two people to land on the moon and the Commander was the lead pilot with the Lunar Module Pilot in something like a co-pilot’s role. This was to be the first flight by a full fledged LM. (By this time NASA had dropped the acronym LEM because the word excursion seemed frivolous, but civilians and the media still called it the LEM.) A LEM mockup had flown unmanned, but the LM that flew on Apollo 9 had been much updated since then. Apollo 9 lifted off on March 3, 1969 into low earth orbit. The Saturn third stage and attached CSM and LM were then moved into a slightly higher orbit, where the CSM separated, reversed and performed its first docking. The multipart cone which covered the LM was jettisoned at this time. (See 569, and animation in the film Apollo 13). The Saturn V third stage separated at this time and the combined CSM and LM moved away. The Saturn V third stage had it’s own work to do. It’s engines were fired again to change the orbit’s apogee (high point). Once apogee was reached, the engines fired again to achieve a solar orbit. This firing did not achieve its proper objective, so a third firing took place later. Practically speaking, this merely got the third stage out of the way, but it also gave NASA a chance to once again check the flight characteristics of the Saturn stage which would, on subsequent missions, place the Apollo mission on orbit to the moon. Aside: if you plan to read more on these subjects you will run into the terms S-IVB, which is the designation for a Saturn V third stage, and SPS, which is the designation for the rocket engine in the Service Module. Now the CSM was flying backward in orbit attached to the LM, and the LM had opened its struts to a landing stance. The CSM fired it’s rocket for the first time (docking had been done on maneuvering thrusters), raising the orbit and providing the first test for the main engine. Aside again: this mission should have happened before sending a crew around the moon. Although most of the events of Apollo 9 were firsts, a few things like firing the CSM’s main rocket had already been done on Apollo 8. However, the ability of the linked-up CSM and LM to fly under power had not been tested before. The next day, the CSM/LM made three more burns, changing orbits and testing the integrity of the CSM/LM connection. On the third flight day, McDivitt and Schweickart (with backpacks) transferred from the CM to the LM by way of the tunnel between hatches. The day was spent testing out the LM, including a six minute burn of the descent stage engine. McDivitt controlled the last minute manually, throttling up and down and shutting off the engine, just as astronauts would do on a actual moon landing. All this was performed while CSM and LM remained linked-up. The fourth day of the flight, McDivitt and Schweickart returned to the LM. Schweickart spent thirty-eight minutes testing his spacesuit outside the vehicle. He had also been scheduled to crawl over to the CM to demonstrate how astronauts could be rescued after returning from a moon landing, should the two craft be able to rendezvous, but not dock. Space sickness made this maneuver impossible, but everything in the hardware itself checked out. On the fifth day of the flight, McDivitt and Schweickart entered the LM for the third and last time, and separated from the CSM. That is fifty years to the minute before this was supposed to be posted, assuming that my math and data from several different sources were all correct. Great plan, but my internet went down for three days. If fact, this post is coming out about three hours late, but at least I made it before Friday slipped away. The major test of the LM descent stage engine had already taken place on day three. Now, it fired twice, first to raise the LM’s orbit and then to make it more circular. This was done to separate adequately from the CSM. The descent stage of the LM was now jettisoned and the ascent stage engine was fired for the first time. This burn moved the LM ascent stage to 75 miles behind and 10 miles below the CSM. Over the next six hours, the LM ascent stage achieved rendezvous and docking. The astronauts moved back into the CSM, and the ascent stage was released. By remote control, it was ordered to fire its engines one last time and burned up in the atmosphere. The descent stage remained in orbit until 1981. The remainder of the flight was uneventful. The CM splashed down north of Puerto Rico. The SM burned up on reentry, as would all subsequent SMs. Almost no one remembers Apollo 9. It wasn’t the first Apollo into Earth orbit and it never went near the moon. It was a working astronaut’s flight, one more incremental testing of equipment. But when it was over, everything was ready for the moon landing. Well, almost everything. There was still the matter of maneuvering the LM downward into a gravity well and out again, and the matter of getting good enough close-up views of the moon’s surface to be sure a landing could be done. Those would be the task of Apollo 10, in May. One last aside: The April issue of the magazine Astronomy has interviews by the astronauts of Apollo 9. It just came out and I didn’t have time to read it before posting this. This entry was posted in A Writing Life and tagged astronomy, history, science, space travel, spaceflight, writing on March 8, 2019 by sydlogsdon. Left photo, the first American spacewalk using an umbilicus. Middle photo, the inner layer of a moon rated suit. Right photo, same suit with outer layer, visor, and backpack. If you have not been following these Apollo posts, here is a quick summary: when three astronauts died on the launch pad, their scheduled flight was renamed Apollo 1. The flight which completed their mission, after much delay, was called Apollo 7 following the original sequence. Apollo’s “2 through 6” never existed. The next flight, originally Apollo 8, was to be a repeat of 7, but was changed to be the first launch of the complete Apollo package, Control Module, Support Module, and Lunar Module. However, delays in building the LM (or LEM as it was called in the early days) meant that flight could not happen by the scheduled date. The Apollo 8 which actually flew was a different Saturn, different CSM without an LM and different crew. They <flew around the moon>. The first flight with all parts of the Apollo was pushed back, renumbered to Apollo 9, and flew fifty years ago yesterday, March 3, 1969. A full picture of the shuffling of missions and crews would take more words that even the geekiest reader could tolerate. Apollo 9 was the second manned flight atop a Saturn V, and the first to have both CSM and LM on board. Jim McDivitt was in command. David Scott was the CM pilot and Rusty Schweickart was the LM pilot. Don’t confuse him with Jack Swigert of Apollo 13. There were two main objectives for the ten day mission. First was to test the ability of the astronauts to dock the CSM to the LM, to undock and fly the LM separately, both as a complete unit and the ascent stage alone, and to dock the ascent stage to the CSM once again. 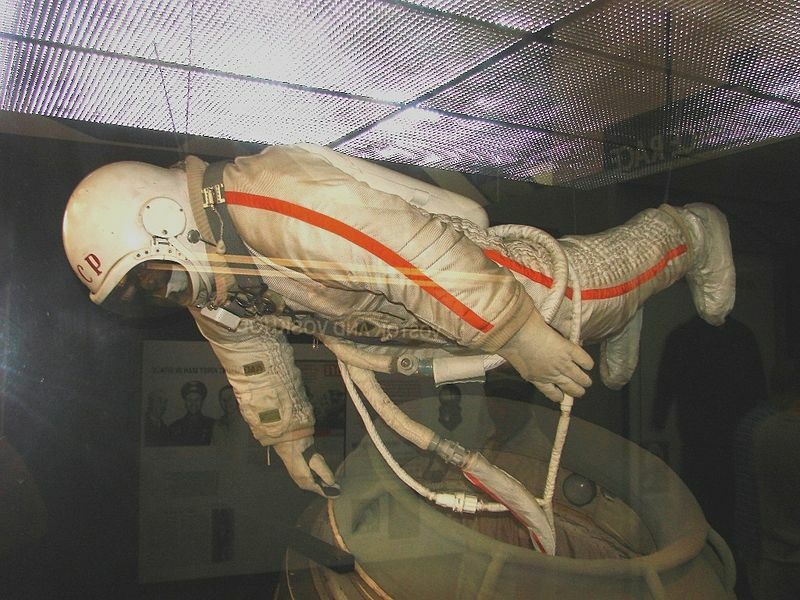 The second objective was to test out the first American space suit which was not tethered to its mother vehicle. We will concentrate on the space suit today and look at the testing of the LM on Friday. That will be posted at 3 PM, PDT, fifty years to the minute from the first separation of the LM from its CSM. The space suits worn by both Americans and Russians had not allowed true freedom. Cooling, power, and life support gasses were never contained in the suits, but were sent to the suits by umbilical connections. As long as the crew was inside the vehicle, this posed no problem. The suits were deflated and for long periods of each mission, helmets and gloves were removed. During launch and return, the suits were again made air tight but were not inflated. There was no need. If the cabin had been breached during those maneuvers, the suits would have continued to provide life support. I never seen it admitted, but clearly both NASA and the Russians were flirting with disaster through all those early flights. Let me explain. When the first spacewalks (EVAs, extra vehicular activities) were made by Alexey Leonov and then Ed White, the space suits proved to massively restrict mobility. Leonov could barely get back into his vehicle because his suit had puffed up so much. Ed White only got back into Gemini IV with great difficulty and with the help of fellow astronaut Jim McDivitt. You can imagine what would have happened on any early fight if there had been a hull breach during a reentry, and the pilot’s spacesuit had suddenly become stiff and unmanageable when every second was critical. Small glitches kill pilots, as everyone in aeronautics knows. Five missions after White’s EVA, Eugene Cernan nearly died during a spacewalk because his suit was so unmanageable. See posts 295 and 296. It took three more EVAs on three missions by three additional astronauts until before spacewalks were brought under control. All of these EVA’s, Russian and American, used umbilicals to provide life support and to tether astronauts to their vehicles. That was not going to work on the moon. The development of a suit suitable for moonwalks took seven years. Pressurization, oxygen, and cooling were taken care of by an inner layer that rarely made it into photos. See the middle picture above. The outer layer was a laminate designed to resist abrasion, radiant heat, and micrometeorites. The backpack took the place of the umbilicus and provided power and oxygen. Backpacks were first tested on Apollo 9 by McDivitt and Schweickart. David Scott performed a standup EVA — that is, he stood up in the open hatch of the CM — but he received life support through an umbilicus. This was the pattern for Apollos 9 through 17. The moon bound astronauts used backpacks, the CM pilot did not. But it did work. The EVA was cut short by Schweickart’s space sickness, but the backpack worked fine. 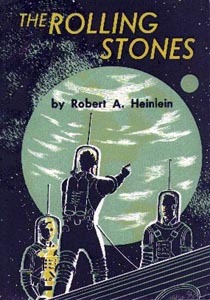 This entry was posted in A Writing Life and tagged forgotten heroes, history, space travel, spaceflight, writing on March 4, 2019 by sydlogsdon.